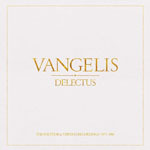 Share the post "Album review: VANGELIS – Delectus (Box set)"
Just too late for Xmas, comes this mammoth 13-disc box set of Vangelis’ albums on Vertigo and Polydor, remastered from the original first generation tapes under the big man’s supervision, and accompanied by a 64 page booklet. But, don’t expect a comprehensive career retrospective – while the box set stretches to 13 albums released between 1973 and 1985, including his three early 80′s collaborations with Jon Anderson, his 1972 debut on Reprise and his four mid-70′s spell with RCA are omitted due to licensing rights. And bonus material is restricted to just four tracks released on singles that never made it onto LPs. So Delectus is, if you will, only part of Part 1 of the Vangelis story and at a fiver short of a ‘ton’ that’s a hefty price for a story without the beginning, only part of the middle, and no conclusion. I’m surprised that the opportunity hasn’t been taken to release a ‘best of’ for those with only a passing interest. Or re-issues of the individual albums themselves? Maybe later? But for the die-hards the box set offers everything that fans of Vangelis already know. That is, the kitchen sink. Ambience par excellence, classical strains, mood music, soulful grooves, industrial, ethereal, world, jazz, majestic and angelic moments. All delivered with unparalleled layers of ‘noodling’. And remastered in glorious ‘widescreen’ stereo, it makes Alan Parsons look like an amateur. This entry was posted in ALBUM REVIEWS, ALBUM REVIEWS (Mobile), All Posts, Reissues and tagged album, ambient, boxed set, Delectus, instrumental, Jon Anderson, new age, orchestral, reissue, review, rock, soundtrack, Vangelis. Bookmark the permalink.